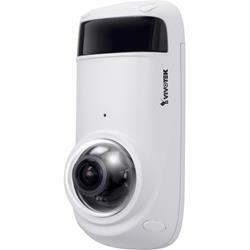 VIVOTEK's CC8371-HV is a vandal-proof IR fisheye network camera offering up to 30 fps at 3-Megapixel resolution. With its unique design and inconspicuous appearance, the CC8371-HV is suitable for a wide array of environments. Featuring 180° horizontal panoramic views with adjustable 25° tilt angle, the camera allows users amazing flexibility of viewing angles and options. The camera's weather-proof compact size also makes it an ideal choice for indoor and outdoor scenarios such as boutiques, convenience stores, banks, schools, parking lots and residential homes. Without ligature edges, it can also be very effective in tough security installations like prisons and mental facilities.